Yup. 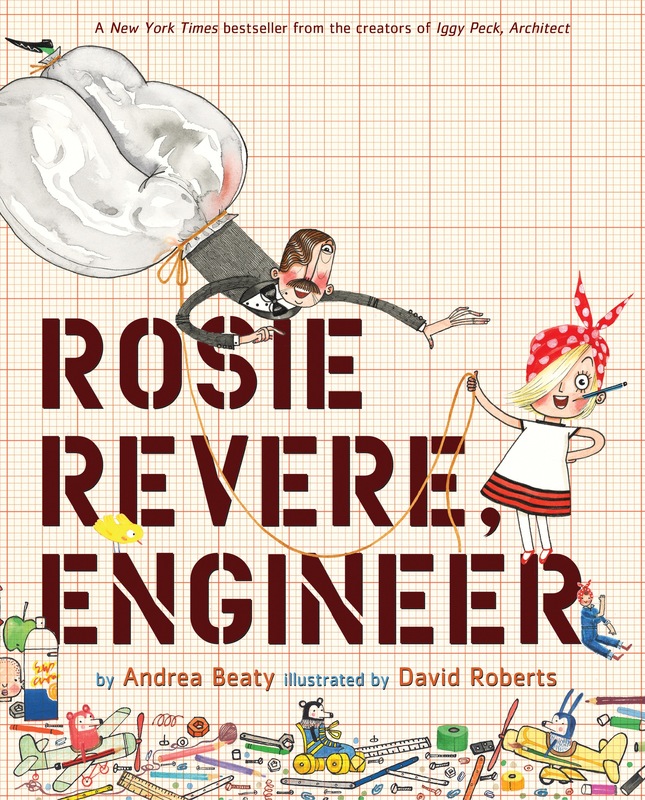 If you liked Iggy Peck, Architect, you’ll love Rosie Revere, Engineer. 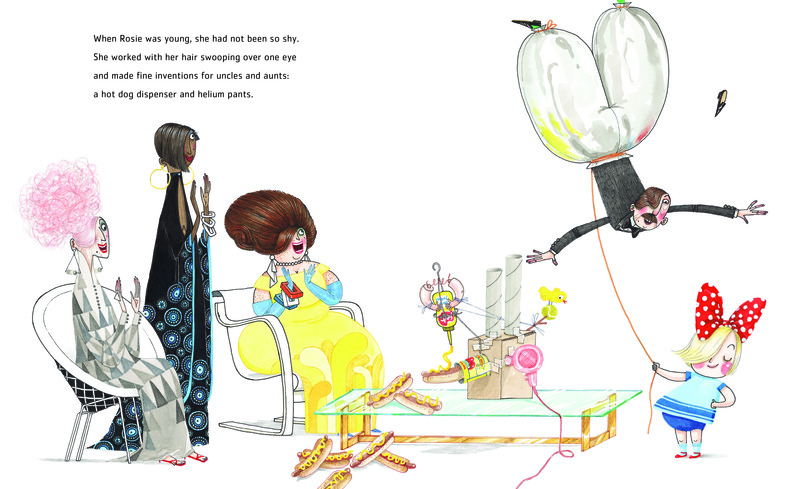 It’s Andrea Beaty‘s story of shy Rosie, who dreams of being an engineer! Whose inventions for relatives are stupendous. And David Roberts‘s illustrations! The graph paper backgrounds, the impossibly wonderful characters surrounding Rosie, the Palm Springs-esque mid-century houses and lawn that don one page. So signature. So good. And the rhyme! Oh how I love the rhyme in this book. “When Rosie was young, she had been so shy. But that was before one of Rosie’s inventions failed. And she stopped doing all that stuff. But you know who shows up and inspires Rosie to try again after failing? Her great-great aunt Rose! As in, Rosie the Riveter (though it’s never said). We know by her clothes and red scarf on her head! Two other things I like best about this book. 1.) The ending. It’ll make you cry, but it’s not the run of the mill success story you’d expect. I love the message that failure leads to success. So true. 2.) The page spread with Rosie and her notebook and a whole slew of sketches of historical flying machines that includes notes about how they were flown in or by women! Thanks to Abrams for images! Here are some toys that are more than just toys. 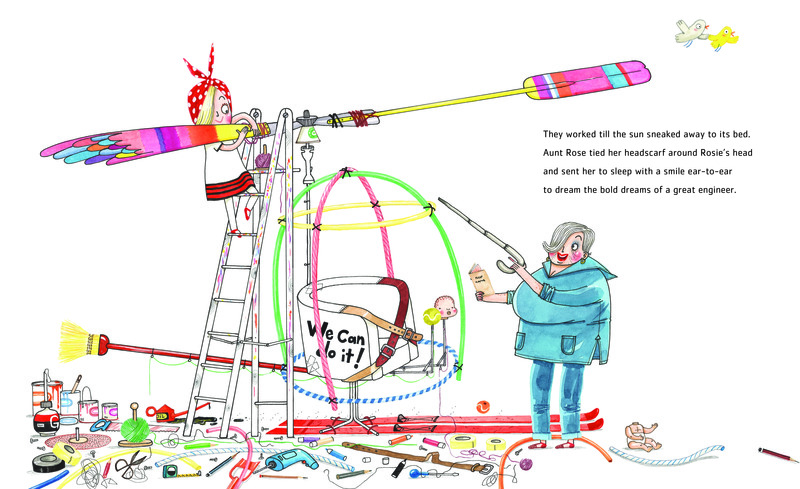 They’re building blocks, if you will, for budding engineers and scientists and inventors like Rosie Revere. GOLDIEBLOX = engineering skill-building game and book series made especially for girls. (Full disclosure: I was a backer of the first kickstarter campaign. And you may have heard about the controversy with Goldieblox’s latest video, but still the toy remains great.) LITTLEBITS = electronic module kits to build cool light/sound/moving stuff. This video will explain it so much better than I ever could! Science fair projects may never be the same! I was provided a review copy of this book; opinions are my own. read the book, build something! As a long time Iggy fan, I was so excited to see Rosie’s book. It exceeded my expectations, which is a rare occurrence. Love all of the building toys. We have those straws and my boys LOVE them. Thanks for commenting, Shelley! And I’m so glad to hear you and yours enjoy those constructible straws! Looks like endless fun.